After discovering the multiple benefits of employing moving averages in an effort to better time the market and identify key support and resistance pockets, the next logical progression of indicators is to focus on the moving average convergence divergence, more commonly referred to as the MACD. The big idea behind this indicator is understanding the best time to establish Call or Put positions depending on the signal produced by the MACD. This is a very valuable indicator for short-term investors in particular, especially if used to define both entry and exit points for a trading strategy. 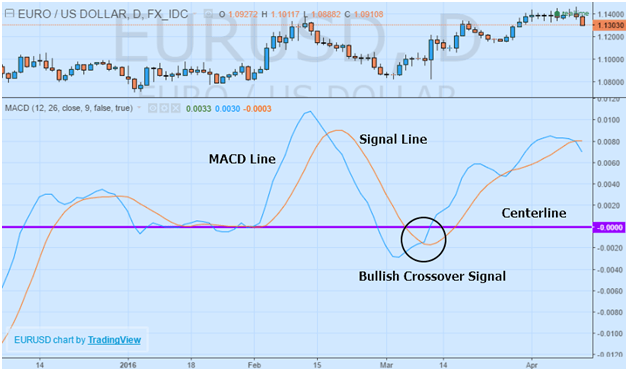 The MACD indicator is comprised of two main components: the moving average convergence divergence line and the signal line. Additionally, on some platforms, there will be a histogram, or a small diagram made up of bars that sits in the middle of the indicator window on the centerline (0) and measures the distance between the MACD line and the signal line. The MACD line is formed by taking the difference between the 12-day exponential moving average and the 26-day exponential moving average. The exponential moving averages are traditionally calculated based on the closing price of the session. The signal line is represented by the 9-day exponential moving average that is again, calculated based on the closing price of the daily candlestick. This line is associated with the Call and Put decision depending on how it behaves relative to the MACD line. The key to applying the MACD indicator is by interpreting signals produced when the signal line crosses over the MACD line. This is traditionally a strategy for dealing with short-term changes in the momentum. For this reason, there are two main setups to identify: a bullish crossover and a bearish crossover. The bullish crossover occurs when the price of the underlying instrument increases at a faster pace (greater slope higher) than previously occurred. A Call signal is generated when the MACD line crosses over the signal line to the upside below the centerline. Once indicated, both lines crossing over the centerline to the upside give a strong indication and increased confirmation that momentum higher will continue. The bearish crossover occurs when the price of the underlying instrument decreases at a faster pace (greater slope lower) than previously occurred. A Put signal is generated when the MACD line crosses over the signal line to the downside above the centerline. Once indicated, both lines crossing over the centerline to the downside give a strong indication and increased confirmation that momentum lower will continue. While, there are additional strategies that focus on combining the histogram with the MACD and signal line, however, this is typically associated with more sophisticated trading strategies. Occasionally, there can be multiple crossovers over the MACD and the signal line either above or below the centerline which can give conflicting signals to the user. In order to avoid these conditions, it is essential that a trader wait for the two lines to cross the center line in order to provide more confirmation that the trend is continuing or reversing. 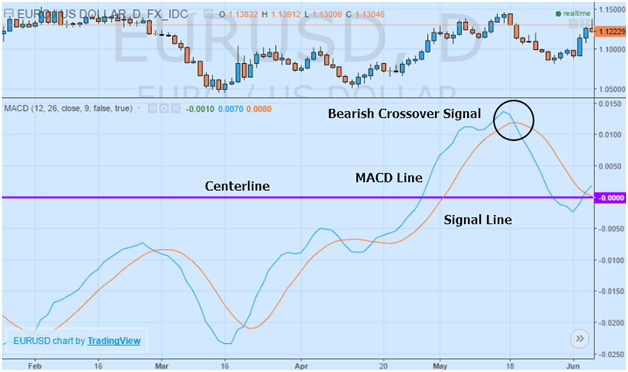 The key to avoid flipping back and forth on positioning in the short-term is to go ahead and wait for strong confirmation of the trend from both the price action in the actual instrument and based on the MACD’s relationship to the centerline. 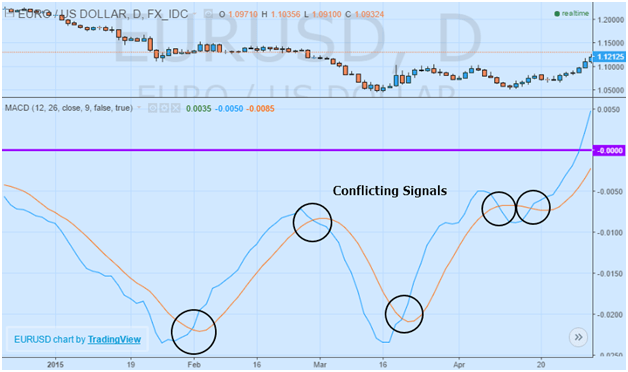 It is always critical to identify the prevailing trend in the instrument to make sure there is not a conflict between the indicator and the instrument’s price momentum. PrevDISNEY Earnings due today – Should you buy or sell?